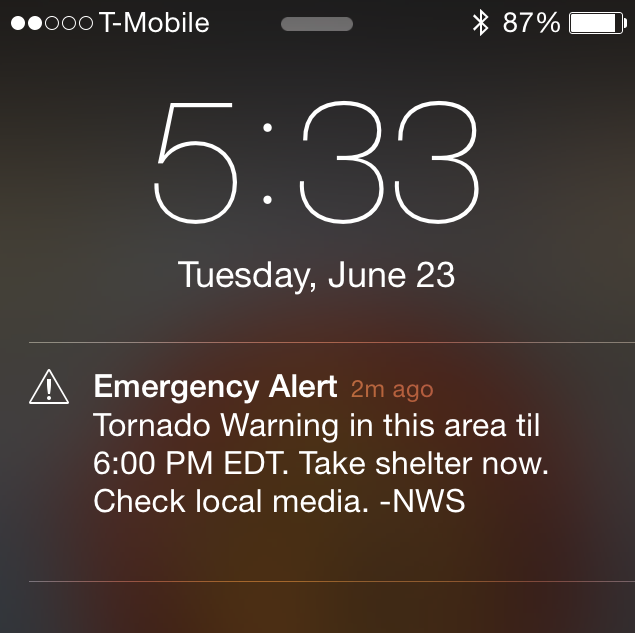 I don’t remember when I set my weather app to warn me of tornadoes. It was probably one of the first things I did when I got my new phone. I am, you understand, terrified of tornadoes. I was in elementary school in Toronto when it started. The school secretary came over the PA system to warn everyone that we were under a tornado watch. And then — this was an elementary school, you’ll remember — she used the PA system to explain to us all what a tornado was and why they were dangerous. And then they sent us all home. My sister worked in the school daycare, so I went to her. But she wasn’t as afraid, and I must have been acting brave, because she soon sent me home. It was only a block away, after all, and she couldn’t have her baby sister hanging out at her workplace. I remember every step of that walk under windy, black skies with a belt of fear around my chest, the tap tap tap tap in my throat that was my heart trying to keep pace with my thoughts. Our house was almost right on the beach and I can hear the waves still — the waves that were always my friend except this one afternoon when everything was dark and dangerous and my enemy. It was only one block and I yearned for our basement, which had narrow creaky stairs and was crowded with boxes from frequent moves and where the neighbour kid had shown me what happens when you flick a lighter and depress a hair-spray nozzle. I wrenched the doorknob toward me and … nothing happened. The door was locked. My mother wasn’t home. My mother was always home. I didn’t have a key — my mother was always home. Although I remember each step of that walk home, each breath I took on that short block, I don’t at all remember the next few minutes. I can’t tell you whether it was five minutes or half an hour. I know I sat on the stoop and was filled with terror till she returned. I don’t remember where she’d been. It doesn’t matter. She was soothing and motherly and probably apologetic, though she needn’t have been. I learned later that my father, at work at 1 Yonge St., saw a water spout over Lake Ontario. Knowing that made me feel a little better, like I hadn’t been just afraid of clouds and wind. Taking cover during tornado warning. Scared shitless and loving it. In the years since, I have studied twisters and know just what to do if I’m trapped on a deserted highway (get in the deepest ditch I can find, far away from the car, with my kids under me) or in a hotel (hunker down, keep the radio on, stay the hell away from the windows). I’ve watched a thousand YouTube videos. For many years I read a storm-chaser’s blog every spring. My fear makes me obsessed. When the little siren wailed inside my car, I was remarkably calm. My hands were shaking and my heart was somewhere between my ears, but I stayed pretty cool. 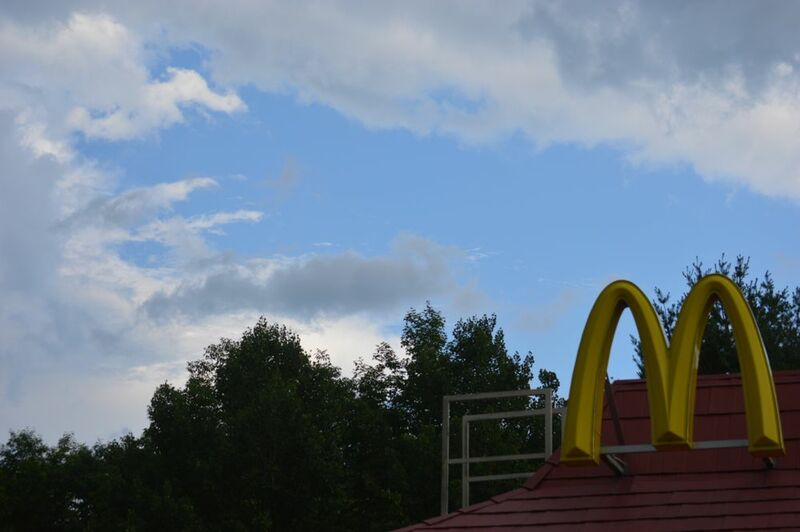 We swung into the parking lot of a mountaintop McDonald’s and used the car’s radio and the CB to find National Weather Service alerts. We sat by the windows in the McDonald’s, though. We couldn’t help ourselves. Trevor and I stood in the parking lot with the GoPro and watched the clouds for a while. It was the first time I had seen such clear, powerful rotation. There was absolutely something trying to form in that giant cloud. Blue skies be damned, that weather system was angry and desperate for an outlet. It spat small bits of hail at us before dissipating. It was terrifying, and spectacular in every way.